Based on the nature of our discussion, spoilers abound ahead! But so does pure literary conversational awesomeness, so weigh your choices and choose accordingly. The first half of our Part II discussion is over at Raging Bibliomania and goes into series detail on the men that populate Middlemarch, particularly the evil Mr. Bulstrode, so hop over there first and then come back here to catch up with the second half, where we discuss almost everybody else. Aarti: I really don’t like Lydgate at all. Like you said, he seems very full of himself and seems so entitled. In many ways, he reminds me of a typical guy at business school! He thinks he’s smarter than everyone else around him, that he deserves the great things that come to him, that women exist to be pretty and supportive, and that his ambition is the most important thing in the world. I really don’t think he’s someone who stands up for his ideals and beliefs, as proven by the Farebrother/Bulstrode episode, and I don’t think he is going to be very trustworthy going forward. Heather: I also get the feeling that he is not trustworthy, and that he will compromise his integrity and morals to get further ahead. The basic reason for him siding with Bulstrode was to further his own interests, and to align himself properly, even though he knew it was wrong. I am sort of mad that Farebrother didn’t get disgruntled with him, because I know that I would have been raging mad had he done the same thing to me. If he is doing these things this early in the game, I wonder what he is capable of later. I was really mad at that, and had held out hope to the last that he wouldn’t make that decision, but he did, and it was disappointing. Heather: He does think much of his scientific prowess doesn’t he? And it is funny the way that he thinks he is above the fray when it comes to being attracted to women, but that is sooo not the case! I actually think Eliot has made his character and his situation comically ironic in a way, because he is so ultra-serious about everything, his work, his methods, his opinions on women, but in reality he comes off as a flimsy and sketchy character who is laughable at best. Well, I should be laughing, but I’m not, because I think he has the potential to do serious damage, and has already had his finger in the pie on one occasion, so to speak. Aarti: I know, I suppose I’d feel worse if I liked Rosamund, but I don’t like her much, either. They are very alike in how self-absorbed they are. Heather: And it is in this second installment that I am seeing how truly funny Eliot can be! She has these pithy asides sometimes that just make me snort. I also like how adept she is at parsing out the intricacies of human behavior and she seems to know quite a bit about the human condition and the way people think. I like that her characters are so complex, and you get to know them obliquely as well as head on. She does have snappy dialogue, but also there is introspection and good depth to the people that she creates as well. “You are very good, sir,” said Fred, with a fine sense of contrast between the words and the feeling. One’s self-satisfaction is an untaxed kind of property which it is very unpleasant to find depreciated. And Rosmund could say the right thing; for she was clever with that sort of cleverness which catches every tone except the humorous. Happily she never attempted to joke, and this perhaps was the most decisive mark of her cleverness. I think so many of her characters are caricatures of people she must have known and interacted with in life, and I wish I knew who it was she was skewering. I have a feeling she and Jane Austen would have enjoyed several chats together about the life of a rural gentlewoman. Heather: Oh, yes, an Eliot and Austen tea party would have been wonderful to attend! I also agree that a lot of these characters are like caricatures, which usually bothers me in modern fiction, but in this case, I think she is using these stereotypical people to represent large amounts of the populace at the time, so I think they are relevant in a way that modern caricatures are not. She is painting a story of society with people and the way they act. These are the players, but they are more than that. They are the message as well. The whole business between Tyke and Farebrother is interesting too, because the special appointment really has nothing to do with either man, or who is more suited to the job, but the players behind them, and Bulstrode in particular. It’s almost like everyone is afraid to oppose him, and I can sort of see why, because he is an imposing figure, and he has everyone in the noose because he is well off and has lent everyone money. Nobody wants to have the well dry up on them, but it’s obvious to me that Farebrother really needs the appointment, and because he has basically been doing the job for free, he has to supplement his income with gambling. I do really like him, and think that he is pretty fair judge of character, and it’s unfortunate that he is getting thrown under the bus, though he doesn’t seem all that put out by it. Aarti: That upset me a lot, too. I didn’t like how Lydgate tried to justify his vote by saying he didn’t like that Farebrother gambled and therefore he didn’t truly deserve the post. (I just really don’t like Lydgate!) I also think Farebrother is one of the best characters, in terms of kindness and understanding and empathy, so it would be nice to see him succeed. I suppose he isn’t ambitious enough, or he doesn’t have as strong a sense of self-preservation as the other characters do. He just wants to do his job, and do it well, but by doing that, he’s gained himself powerful enemies and is made to be less effective and helpful than he could be. It reminds me of a lot of bureaucratic organizations such as the police system (as described in The Wire) and the public school system- so many great people who just get mired in the politics and can’t get their jobs done. Heather: I also was really interested in the bit about Dorthea’s honeymoon, because it seems as if the blinders are coming off, just not in the way that I thought that they would. The way that Eliot alludes to Casaubon’s brain being like a labyrinth instead of unencumbered and open like the sea seemed a very apt way of describing someone that has such a studious nature and is so opposed to natural feelings. I could clearly see that a misunderstanding on Dorthea’s part was occurring, but Casaubon had no such delicacy of feeling when it came to seeing what was wrong with her. Aarti: There is a quote I am completely mangling that says something like, “There is no one so terrifying as an absolutely just man.” This really brings Casaubon to mind for me. He is so logical, so completely without feeling, so focused on the right and wrong of things as they relate to him, that he has no place for nuance, no gray areas, no forgiveness in him. And Dorothea, who is so passionate and inspired, is exactly the opposite. I don’t know how the two will ever understand each other. Heather: I don’t think they understand one another at all. There is an absence of feeling in one, and an overabundance in the other, and that is something that cannot be bridged without serious contemplation by both parties, which is something that is just not happening between them. It’s pretty sad that Casaubon can’t be honest about how he has this lack of feeling towards not only his wife, but other humans in general, and it’s a pity that Dorthea is placing the blame upon herself. This marriage, and Ladislaw’s insertion of himself is an interesting, if expected development. At the point when Ladislaw came in and saw her, I could sort of feel the sparks flying from him to her, but she seems to be one who is just naive about things like that. I can’t see how she doesn’t see that he is attracted to her, especially with all the invectives he is throwing down against her husband! I can already see that Casaubon is jealous, and that it’s going to be awkward when it comes down to brass tacks. Aarti: I agree, she is totally clueless! And seems not to realize how her husband reacts to it all. There’s just no stealth in her at all, which I admire but think will come to really hurt her in the future. I can’t help but think that Dorothea is set up for so much sadness in life. I would feel sorrier for her if I didn’t think she seems like the sort who would really enjoy suffering as her way of atoning for sins or something. Heather: Very astute observation. She does think she was designed for suffering, so I an fearful about what will come of all this with her and Casaubon. All I have to say is that I'm saving these conversations up for when I read Middlemarch later this year. I always get more out of Quality or Classic books when I hear smart people talking about them while I'm reading. (sigh) I miss English classes in college. I think it's so interesting that as we go along, the people in the book become more and more objectionable and manipulative. 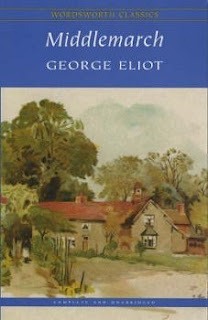 The first section was milder, not only in the way Eliot portrayed the characters, but in the things they said and did. There is much more in the second installment for a reader to get up in arms about. I am looking forward to discussing Part 3! Lydgate was annoying. Zibilee's right, the more you get to know some characters, the more tiresome they become. I am so sorry I missed this group read -- your conversation is fascinating. I think LibraryHungry has the right idea in saving the conversations for when I finally get to this classic on my own! It's clear that you don't find the word "caricatures" to be negative in the case of Middlemarch. Still, it would be a word I'd hesitate to apply to this book, because I think George Eliot does strive to make her cast of characters very human and not just 'a type.' Even some of the more odious characters get their moment of almost sympathy, or at least become slightly pitiable. But maybe that is a conclusion that I drew only after finishing the book. I don't recall. Very much enjoying this indepth discussion of each book of Middlemarch! And Dorothea just gets better and better as the book goes along. And Lydgate is such a fool though Rosamund is even more the fool. I too felt like I needed more than one post to express what I thought of it - although I wrote the posts after I'd finished reading it. Oh, interesting. No, I don't mean caricatures in a negative way. I meant in more as in the characters are exaggerated and larger than life. I agree they are human, but they are described in such detail and we get to know them so intimately. Then their actions and words can really take on a life of their own.